Thallium - 81Tl Your user agent does not support the HTML5 Audio element. Thallium has two stable isotopes and one of these, Tl-203, is used to produce one of the (workhorses( of nuclear medicine: Tl-201. Tl-201 is used extensively for imaging and in particular for perfusion tests of the myocardium. These tests are done to determine the damage to the heart from a heart attack or from heart diseases. Tl205 has been proposed as an alternative target for the production of Tl-201. Tl-205 is also used in nuclear magnetic resonance research. This table shows information about naturally occuring isotopes, their atomic masses, their natural abundances, their nuclear spins, and their magnetic moments. Further data for radioisotopes (radioactive isotopes) of thallium are listed (including any which occur naturally) below. 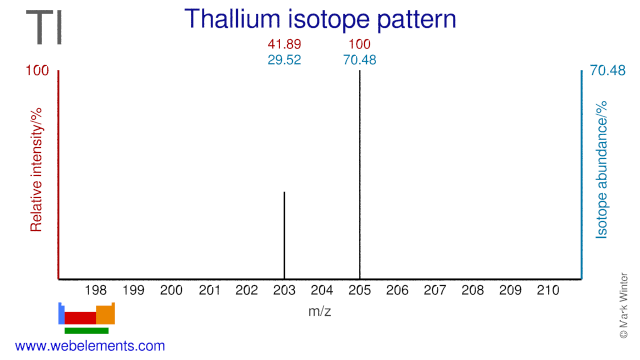 Isotope abundances of thallium. In the above, the most intense ion is set to 100% since this corresponds best to the output from a mass spectrometer. This is not to be confused with the relative percentage isotope abundances which totals 100% for all the naturally occurring isotopes. Further data for naturally occuring isotopes of thallium are listed above. This table gives information about some radiosotopes of thallium, their masses, their half-lives, their modes of decay, their nuclear spins, and their nuclear magnetic moments.